Bleached to meet FDA standards for distilled water, beverages, vegetable oils, petroleum, fatty acid amd alcohols. For use to 300°F. Poor micro-organism resistance. Big Brand s string wound cartridge filters are manufactured using a high speed, continuous wind process which creates a superior one-piece filter with hundreds of diamond shaped tunnels that get progressively smaller from the outer diameter to the core. Finer particles are progressively trapped as fluid travels to the center of the filter allowing for much greater retention capacity than that which is associated with straight surface filter media of the same dimensions and porosity. 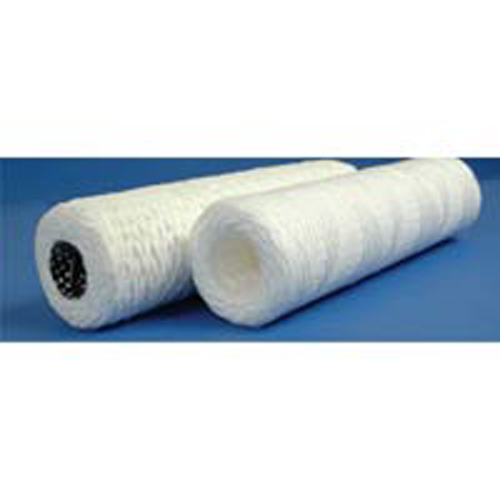 The winding pattern provides 3.5 square feet per 10" cartridge filter. For each 10" filter length there will be approximately 1/2 to 1 lb. retention of solids before replacement becomes necessary. The amount of solids retained depends on the type of solids in the solution as well as the head pressure developed by the pump. Big Brand s wound cartridge filters offer a true depth filtration for high dirt holding capacity and extremely low media migration. Thus, even when the particle distribution of the contaminant is broad, Big Brand filters have excellent dirt holding capacity because of density and structure. Therefore, it is not unusual for a set of cartridges to filter many millions of gallons of fluid before requiring replacement. This means less equipment downtime, extended life for chemical solutions, cleaners, oils, coolants and liquids, not to mention the savings in labor and materials. FDA Bleached Cotton Media Bleached to meet FDA standards for distilled water, beverages, vegetable oils, petroleum, fatty acid amd alcohols. For use to 300°F. Poor micro-organism resistance.